…We build what we are, whether the system is technical, political, familial, organizational – the systems mirror their designers. The only way, therefore, to dramatically transform those systems is to transform the people/organizations that build and maintain them. The impact, however, can be profound. Like the youngster who views an optical illusion and is unable to distinguish the alternate image until a parent asks, “Do you see the mouse’s tail?” at which point, the youngster not only recognizes the image, but gains an alternate knowledge about it. In the future, they will see the mouse (tree, pattern, idea) whenever they view the image that once confused them. So it is with our information systems or our transportation systems or our political systems. We have more than simply “an important role.” We are a component of that system at the architectural level – to view the system without those components is to view only a partial schematic. For someone so familar with a daily writing routine, and so embedded in network phenomena, I am somewhat chagrined that it is only now that I am beginning the blog. I am launching this site to begin a conversation. While it begins and ends with principles proposed in my book, The System is a Mirror (in bookstores on August 7), I'm certain that many subjects related to humans and computers, over the course of time, will announce themselves. This morning, I presented my Prime Theorem at the Ventana Research Analysts Conference in San Francisco. That theorem: we mirror ourselves in the systems that we build, and therefore, to transform our systems, we must first transform our organizations. 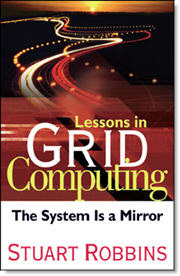 (See my consulting website for more information about the book): http://www.srobbinsconsulting.com/system.html. Everyone "got it." Some even suggested that it makes them think about IT in an entirely different manner. One or two of the more lethargic attendees seemed to be asking, "OK, so far so good. Keep going. What's next?" Thanks to the team at Ventana for inviting me to speak about the book, and my notion that all IT projects (Grid, SOA, distributed, diffuse) must now involve this central theme. The conference's overall agenda focused upon Performance Management (what does Cognos and the SunTrust Racing Team have in common?) though, in the end, it seems to me that Performance Management is a new phrase describing last year's Operational Excellence, etc etc. To me, the key issue remains: why do we, as IT executives and managers, wholeheartedly agree that the technology is the easy part, and that 95% of our real problems are on "the people side." And yet, we continue to focus only on the technology. In turn, our vendors only focus on technology. In turn, the press and The Street focus on technology. We are the platform. We are the key components on the network. And we still do not know how to manage ourselves.